SE-DesktopConstructor is a freeware to customize desktop. This free desktop constructor lets you create your own desktop. You can choose your own wallpaper, place clock on that, create your own calendar, add gradient, create colored areas for icons, and more. There are a few desktop wallpaper changers that we have reviewed earlier, like: Background Switcher and Scrollwall. However, SE-DesktopConstructor goes beyond just being a desktop wallpaper changer. You can of course wallpaper also with this free desktop customization software. You can specify when should wallpaper be changed. You can change it daily, hourly, or even every minute. Once you have configured wallpaper, you can control its gradient. 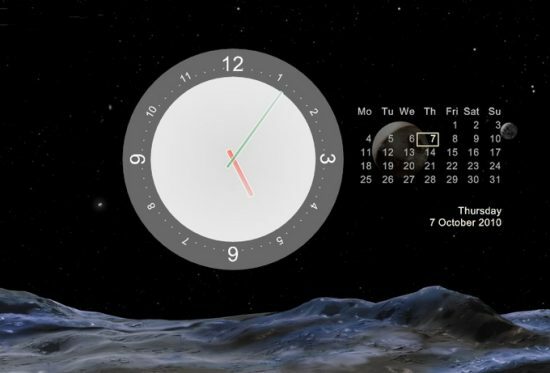 You can also place clock and calendar on your wallpaper. SE-DesktopConstructor comes with 20 preset clocks, and you can choose from any of those. You can also create your own calendar, and place that on your desktop. If you want to access emails on your desktop, you can try Paste Outlook on Desktop. SE-DesktopConstructor is easy to use, and can nicely dress up your desktop. Also check out free mac style toolbar for Windows desktop.